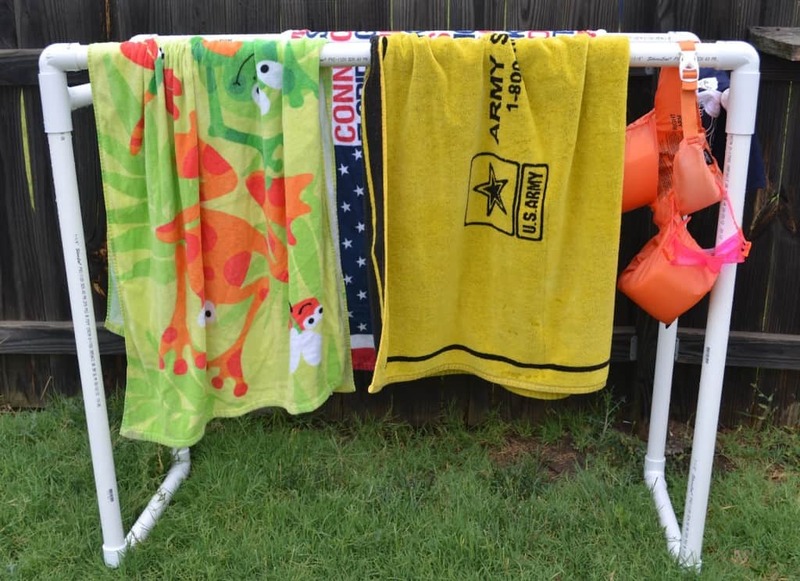 How to build a functional PVC pool towel rack. A simple DIY that is perfect for your backyard pool needs. The rack will keep dripping towels and suits off the floor and out of the house. There are so many great things you can do with PVC pipe, from kids car washes to shoe organizers. Just search PVC on Pinterest and you will find a boatload of ideas if you’re interested. During the Summer we are usually outside in the pool every single day so washing towels or swimsuits daily just wasn’t going to work. Of course, you can purchase one if you would like but we didn’t really need one that big nor did I want to spend $200+. 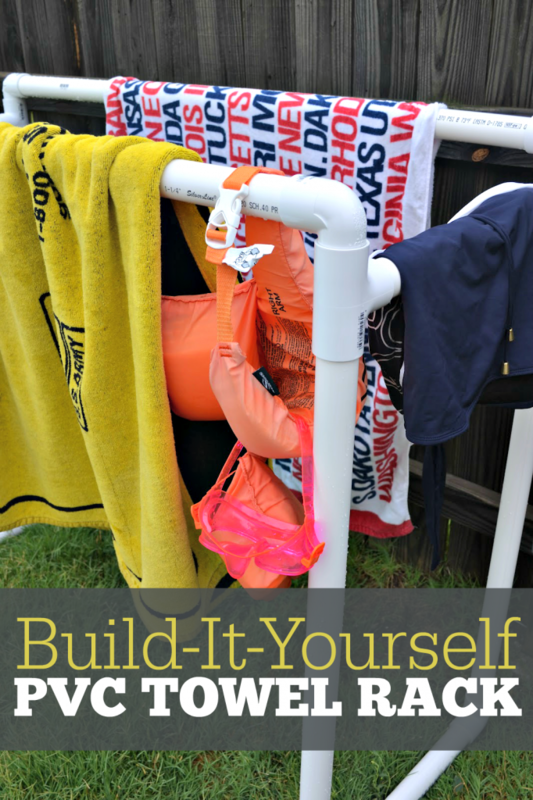 There are all kinds of ways you can go about making a PVC pool towel rack from simple designs to large designs but we just wanted something simple that would hold our towels plus a few swimsuits. Here are some pictures if the fittings confuse you. This picture below is a sideout elbow. This would work in place of the tee and elbow with the slip if you can find one in the sizing you need. We couldn’t find any in the 1 1/4″ size. Once you have cut all your pieces start fitting the pipe pieces into the fittings. You will connect the foot elbows with the 37″ pipes (the legs) and then connect 2 of the legs to one 17.5″ pipe. At this point, you should have created two large side legs pieces. You will then connect the tees to the tops of the 37″ pieces and again connect the 17.5″ pipes to those. You will have created a rectangle and now you are ready to connect your elbows with slips. The slip side will go down into the tees and you will connect your towel bars to the other side. To be honest, trying to read the directions of me explaining it is probably more confusing than just using the pictures above and just eyeing it. I’m pretty sure all of you can figure out what goes where. This PVC pipe is not furniture grade so you will have the ugly wording on the sidebars. It doesn’t bother me for now but if you want you can paint your towel bar. I would strongly suggest roughing it up with sandpaper prior to painting so the paint will adhere better. I would also recommend a coat of primer to help cover up the markings. Oh, this is fantastic!! What a simple (and useful DIY!) I can see it put to so many good uses even beyond hanging pool towels…. I hopped over here from Blog until you Drop… hope you will Visit My Blog, too! Very good idea! And much better than spending $200 on Etsy! PVC is so versatile!! This is a great diy!! this is such a great idea! I’m always looking for a spot for wet towels. Great Idea. I might not get it done this summer but I’m pinning it for next summer. To remove the words from the pipes forever, simple rubbing alcohol or plumbing pipe cleaner will do it. All you do is get it on a rag & wipe it off. period. no “elbow grease”, no fighting or struggling..just gently wipe it on & watch it disappear. one 10 foot section of pipe can be cleaned in about 2 – 3 minutes. You don’t even have to wipe it down afterwards….once you wipe it down with the alcohol/pipe cleaner, it takes about 30 – 45 SECONDS to dry…you will feel no residue afterwards…ever. I’ve plumbed many a house & barn, so I speak from experience. I never thought about using alcohol to take the words off the pvc pipe, great idea. Thanks! FYI – to get the words/lettering off the pipe, simply wipe it down with paint remover. Works great and removes all scuffs, wording and dirt!